Yesterday, me and my colleague Martina Ferracane at ECIPE launched the DTE database which describes all digital trade policies for 65 countries worldwide. The DTE database is part of the wider DTE project that aims to provide transparency regarding digital trade policies in the world of international trade and trade policy. Besides the database, the project also covers an index summarizing all these cost-enhancing measures in the digital economy for all countries and issue areas. It also provides a website where you can find all this information and a final report. The DTE database covers 13 chapters, each comprising a digital trade policy area, namely (1) Tariffs and trade defence, (2) Taxation and subsidies, (3) Public procurement, (4) Foreign investments, (5) IPRs, (6) Competition policy, (7) Business mobility, (8) Data policies, (9) Intermediate liability, (10) Content access, (11) Quantitative trade restrictions, (12) Standards, and finally (13) Online sales and transactions, i.e. e-commerce. Although the full index and report will come out in November, people can already access the database as of now through the following website: http://ecipe.org/dte. Moreover, during yesterday’s presentation of the database, I showed a small snapshot of the index as shown below. Note that all other countries that are coved by the DTE project, including all EU member countries separately, will be disclosed during the launch of the report which will also explain our methodology. The index ranges from 0 (most open) to 1 (least open). 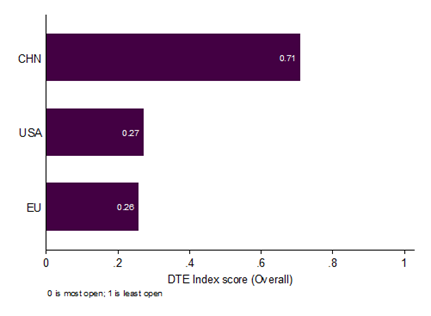 Unsurprisingly, one can see that China is the country with the highest score, meaning it is least open of all countries covered whilst the US and the EU have a far lower index score though still higher than the average score of the entire range of countries covered. Note that the EU score is a weighted average in the sense that this score corrects for the size of each member country’s market. If this weren’t taken into account, the index for the EU would be somewhat lower, i.e. a score of 0.22. One surprising result, however, is the fact that that the US and the EU are actually on (almost) equal par with each other when taking into account all 13 chapters. The main reason for this outcome is that the US still has quite some cost-enhancing digital trade measures in place when it comes investment and competition policy, but also related to public procurement and even standards. More on that in the database and the report that will come out soon!